Green building has entered an exciting new realm. Archiblox, an Australian architecture firm, has unveiled the world's first carbon-positive prefabricated home. The Archi+ Carbon Positive House, currently on display in Melbourne's City Square, is so efficient it can put energy back on the grid. How is that possible? The home has all the bells-and-whistles of a sustainable dwelling, including solar rooftop panels, in-ground cooling tubes, sliding edible garden walls to block the sun's rays, an external planter bed to take grey wastewater and filter for toilet flushing, and more. Green Magazine writes that over the home's lifespan, it will emit 1,016 tons of carbon dioxide less than standard or average buildings with the same functionality. That's the equivalent of taking 267 cars off the road or planting 1,095 native Australian trees, the publication says. And because these homes are prefabricated, construction from start to finish only takes 12 to 28 weeks, reducing costs and resources. Archiblox's buildings are made with sustainable building materials that are formaldehyde and VOC free, such as a modular cabinet area with a "shladder" (a shelf and ladder) that leads to a hidden loft that can also be used as an extra bedroom. "We have no mechanical heating and cooling in the home. We've got cool tubes to pull in cool air from the Earth, which is used to ventilate the house," ArchiBlox architect Bill McCorkell told the Sydney Morning Herald. "We have five kilowatts of solar power on the roof, edible gardens within the house itself, so it can be a bit self-sufficient for food production ... 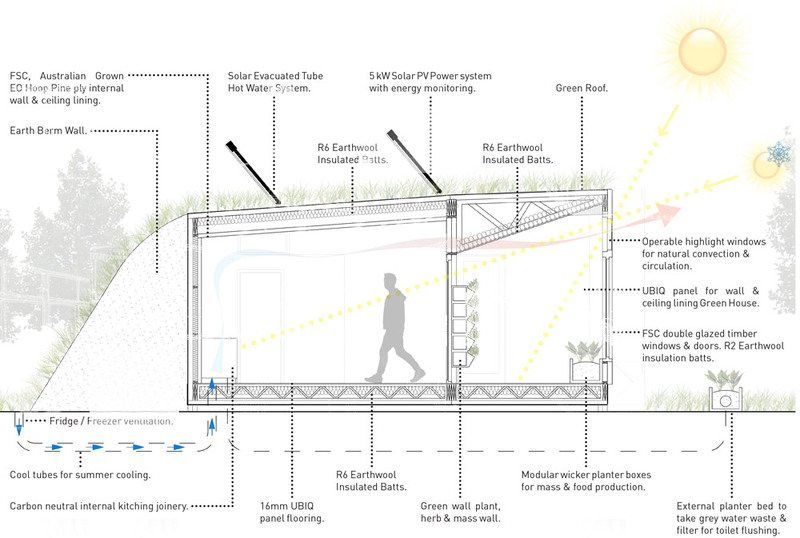 The whole house has been designed to maximize solar gain. There are no fans, it's all just naturally ventilated, cooled and heated." The living areas, such as this "buffer zone" in the Melbourne house, are awash with natural sunlight and allow dwellers to grow plants and vegetables. The cost of ArchiBlox's carbon-positive buildings start at $238,000AUD plus taxes, or approximately $185,687USD, for a 3 bedroom/2 bathroom unit measuring around 300 square feet. Although it's a pretty small space (those living in one would join the growing tiny home movement), the price tag is well around the median cost of a U.S. home, which is around $188,900. But that's not evening including the amount of money saved on energy. In order for us to slash our unsustainable energy consumption, one good place to look is the roof over our heads. And while there certainly are plenty of green buildings out there, including Honda's experimental zero-carbon home sitting on the University of California at Davis, the fact is, the average American home uses up to 10,908 kilowatt hours annually, and we hope more projects like this take off.